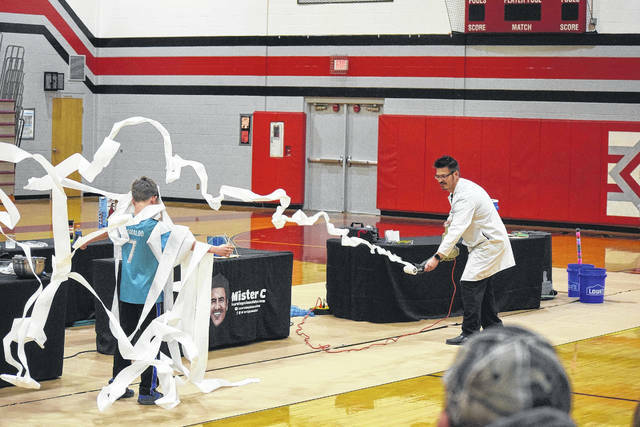 On Tuesday, March 13, Tri-County North Elementary School presented its fourth annual Family Fun Night, which featured Mr. C The Science Guy. According to Principal Joe Finkbine, this school year’s theme is “Mission Possible,” so they wanted to host a STEM event which showed the kids incredible feats through science. 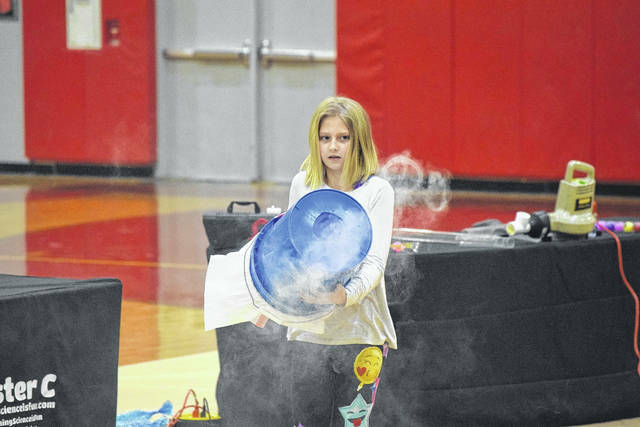 LEWISBURG — On Tuesday, March 13, Tri-County North Elementary School presented its fourth annual Family Fun Night, which featured Mr. C The Science Guy. 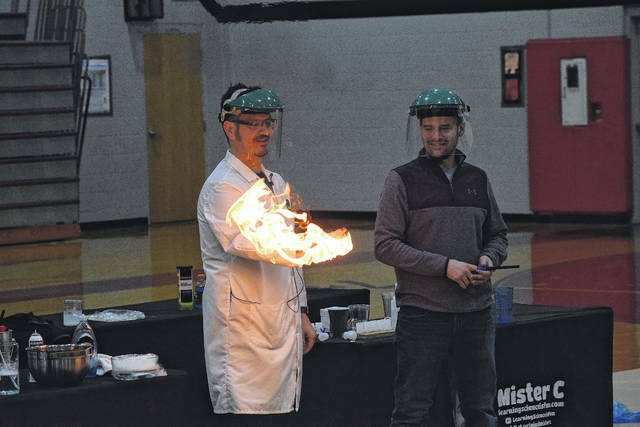 According to Principal Joe Finkbine, this school year’s theme is “Mission Possible,” so they wanted to host a STEM event which showed the kids incredible feats through science. Not only did The Science Guy make an appearance, but there was a dinner from Rob’s Restaurant, a visit from a Wizard of Wright, Rick Willis (from Wright Patterson Education Outreach Program,) a story time by Lisa Conley, and a rocket engine ignition on the pavilion. According to Finkbine, the event served to satisfy the requirements under Title I federal funding, which state the school must engage its community in helping parents understand the impact sharing a learning experience can assist in enriching their child’s educational experience. “TCNES chooses to do this in a form that not only enforces literacy, but also what is going on in the classrooms in a fun engaging way. Our theme for this school year is “Mission Possible,” so including a STEM and solar system focus fit very well,” he said. “Title I Federal Funds were used to pay for the evening events as well as for every family to receive a book related to our theme. The event was mainly for elementary students, but children with siblings, as well as local child care and preschools, were invited and welcomed. On Friday, May 18, TCNES will participate in a local history cemetery walk. Students will learn about local history in preparation for the Lewisburg Bicentennial Celebration later this fall. Locals will dress up and re-enact important people in Lewisburg history throughout the cemetery. 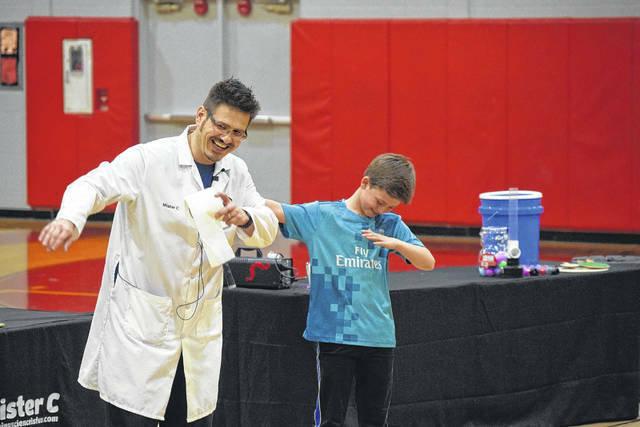 https://www.registerherald.com/wp-content/uploads/sites/41/2018/03/web1_TCN3-1.jpgOn Tuesday, March 13, Tri-County North Elementary School presented its fourth annual Family Fun Night, which featured Mr. C The Science Guy. 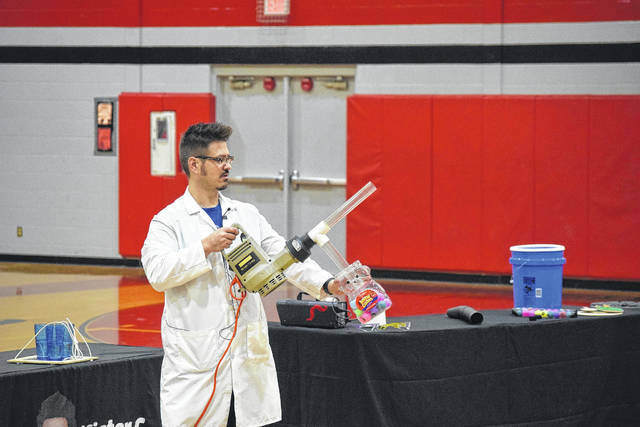 According to Principal Joe Finkbine, this school year’s theme is “Mission Possible,” so they wanted to host a STEM event which showed the kids incredible feats through science.